As you study the Bible, you may find it useful to write your notes in an outline. The Bible Surveys we are going to study later include outlines of each book of the Bible. An outline provides an overview of the general content of each book. These outlines are only a starting point for you to develop more detailed notes for each book of the Bible. To do this, you must know how to create a proper outline. An outline is a form of summary that helps you organize your study notes. An outline helps you "hear with your ears and receive in your heart" the Word of God (cf. Ezekiel 3:10 and Matthew 13:15). An outline focuses on a selected subject (e.g., book, topic, or character). The main points in the outline tell you something about the subject. There are also sub-points that tell something about the main points. The prefix "sub" means "secondary or lower position". In an outline, sub-points provide more detailed information about the preceding main point or sub-point. Uppercase alphabetical sub-point that provides additional information about the first point above. Second uppercase alphabetical sub-point for different information about the first point above. Numerical sub-point for different additional information about the alphabetical sub-point above. Next numerical sub-point that provides additional information about the sub-point above. Lowercase alphabetical sub-point that provides additional information about the sub-point above. Next lowercase alphabetical sub-point . If you need yet another level of sub-points, you start over with the uppercase alphabetical sub-point indented under the last sub-point, then numerical characters, and so on. 31What then shall we say to these things? If God is for us, who can be against us? He who did not spare his own Son but gave him up for us all, how will he not also with him graciously give us all things? 33Who shall bring any charge against God's elect? It is God who justifies. 34Who is to condemn? Christ Jesus is the one who died--more than that, who was raised--who is at the right hand of God, who indeed is interceding for us. Here is an example of an outline you could develop from those verses. Remember, everyone writes outlines differently. As you dig deeper into God's Word, your outlines will change and expand also. There is no one right or wrong way to write an outline. You can see how this outline summarizes the confidence we have in Christ, as the Apostle Paul wrote in Romans 8:28-39. No matter how well you outline your subject matter or how many times you've gone over it, you will probably never complete your outline study of God's Word because "...the word of God is living and active, sharper than any two-edged sword, piercing to the division of soul and of spirit, of joints and of marrow, and discerning the thoughts and intentions of the heart." 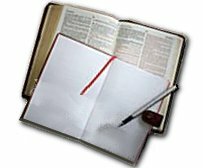 (Hebrews 4:12) The Holy Spirit will constantly give you new understanding about the Word which you will want to add to your outlines.